It is with great regret that New England Glass Co. has shut down its “small repairs” department and is no longer accepting walk in customers. Over the past five years New England Glass Co. has evolved into a largely commercial-focused company and we want to put as much focus and attention there as we can. 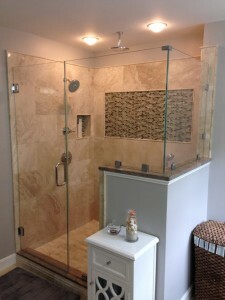 We will continue to offer our full line of Shower & Tub Enclosures. Visit our showroom at 31 Connecticut Ave, Norwich CT to see what we have to offer or give us a call at 860-887-1649 to set up a consultation. We have taken pride in serving our customers and are very thankful for your support over the years! In our continued effort to assist we have gathered the following list of local residential glass, plexiglass and screen service/repair companies. United Glass & Mirror Co.
Bozrah, CT 06334 Residential Work, in-shop only. Mystic, CT 06355 Residential work, in-shop & on-site. Residential work, glass, screen, plexi. SS & 1/8” glass; 1/8” plexi. Some mirror. Some window work (probably not IG’s). Re-screen and new screen frames. SS glass & plexi for single-pane windows. Can order safety glass. New England Glass Co. began providing residential services in 1934. Even in the middle of the great depression we provided excellent, affordable services. The scope of residential work we take on has fluctuated over the years. We take pride in how we became a business and are very thankful for our customers throughout the years.